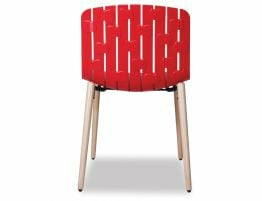 Gotcha original red dining chair is the brainchild of Spanish design team Enrique Del Amo and Angel Marti. 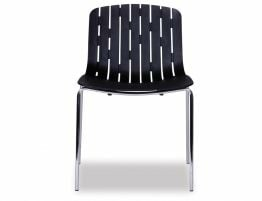 With comfort as the main objective, the Gotcha chair is slightly oversized with an unmistakable contemporary split back design. Aesthetically striking when used in a commercial space as is in your casual dining areas. Gotcha red chair is sturdy and durable to withstand the most active of areas. A simple wipe down is all you need to clean Gotcha, especially handy if you have young children or busy cafe. 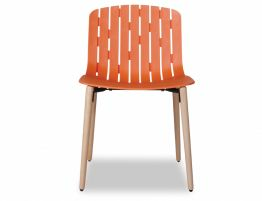 Warm natural legs compliment the vivid red seat to create a welcoming and exciting presence. When considering café furniture or commercial dining chairs, you need a chair that not only looks stylish, you need one that can hold up to heavy use, yet still maintains a lighter weight that is easy to handle. 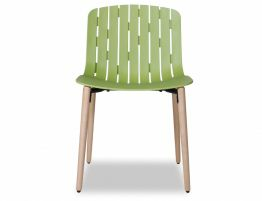 Gotcha chair is such a design.